GUTHRIE, Okla. – The grind of professional rodeo offers many challenges and requires many sacrifices for those that are successful. Nobody understands that better than Trevor Brazile, the “King of the Cowboys” who owns the most world championships in the sport’s history. He owns several PRCA records, including the most world titles (24), most all-around world championships (14) and the most money earned over his career – so far, that figure sits at nearly $7 million. Now 42, he’s realizing that the sacrifices need to be fewer while still chasing challenges. That’s why he is limiting his rodeo schedule, likely eliminating the chances for more PRCA gold buckles or even qualifications to the National Finals Rodeo. His focus is on family, and that’s a good thing. As his three children grow, their activities do, too, and Brazile doesn’t want to miss as many of those. 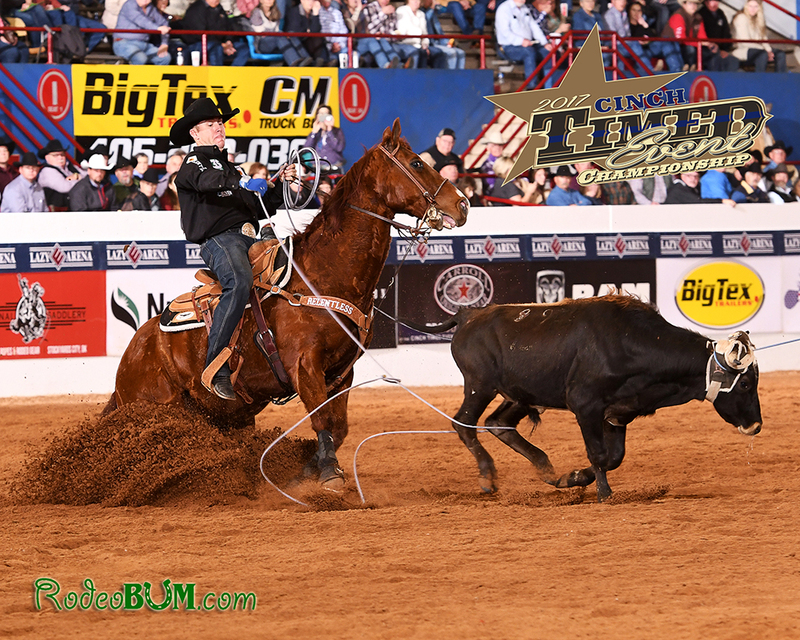 While his schedule will be diminished greatly, he still has some major events on his calendar, and the CINCH Timed Event Championship is at the top of his list. He will return to the unique competition, dubbed the “Ironman of ProRodeo,” set for March 8-10 at the Lazy E Arena. For information on the event and to order tickets, visit www.LazyE.com. It’s a test he knows well. In the 22 years since he first competed at the CTEC, he’s won the Montana Silversmiths CTEC gold buckle seven times, more than any other competitor in its 35-year history. It also offers a great financial incentive, the $100,000 prize that goes to the winner at the conclusion of the five-round, three-day slugfest. In an event where each cowboy must compete in all five timed-event disciplines – heading, heeling, tie-down roping, steer wrestling and steer roping – just to complete one round, it takes a mental fortitude and true athleticism to come out successful. But the rewards are plentiful: the runner-up will earn $25,000. “When you talk about the mental and physical grind that it takes, it’s a lot of both,” Brazile said. “I don’t know what makes it fun, but it’s fun. I love competing. If I were to make a list of what makes it fun, No. 1 would be the $100,000. Second would be getting on the same playing field with 19 other guys. There are fireworks that happen each round, but the CTEC is a true spectacle. As has happened in years past, the annual chuckwagon cooking contest will take place in conjunction with the festivities. It was named the 2017 American Chuck Wagon Association’s event of the year. Breakfast will begin at 8:30 a.m. Saturday, and the dinner will begin at 3 p.m. Tickets may be purchased through www.Ticketmaster.com. The hottest ticket, though, is to see the 20 greatest all-around timed-event cowboys in ProRodeo today. Over the course of the storied championship, only 14 men have walked away from the Lazy E with the title. Seven of those men will be in this year’s field, and Brazile is just one of them. He will be joined by K.C. Jones (5), Daniel Green (3), Kyle Lockett (2), Paul David Tierney (2), Jess Tierney and Jordan Ketscher, the last of whom is the reigning titlist. It goes back to being one of the most unique events in the sport, where team ropers must wrestle steers and steer wrestlers must rope them. It challenges every man, and it happens through five rounds over just three days. While the cowboys are used to stopping the clock in 7.0 seconds in tie-down roping or 3.5 seconds in bulldogging, the key to success at the CINCH Timed Event Championship is being consistent over 25 runs. “That part of it’s changed a lot over the years I’ve been part of it,” said Brazile, who joins header Clay Smith as the 2018 PRCA champions who are part of this year’s “Ironman.” “If you go into it with a practice-pen mentality too much, you’re not going to win it. You still have to be somewhat aggressive. There are some things that will happen that are out of your control, and you can’t let them be a downward spiral. Make no bones about it, he’s good. In fact, he’s the best there is in the game today. He’s a factor, and the other competitors know that very well. Some of that has to do with his impeccable work ethic, and part of it has to do with his talents in the arena. “He’s a top 15 contender in every event he chooses to be in,” said fellow CTEC cowboy JoJo LeMond, who pointed to Brazile’s two Triple Crowns, when he won three gold buckles in 2007 and 2011. Brazile cherishes every victory and every moment. He celebrates the opportunity to engage with fans, and there are none better than the ones who fill the Lazy E Arena through the second weekend in March. “I go to rodeos all over the world, and people will come up to me and say they go to their hometown rodeo and the Timed Event every year,” he said. “If you’ve ever been a fan of the Timed Event, you’re always a fan of it. They’re fans of grit and determination as much as they are of rodeo. Marcus Theriot – Poplarville, Miss. Lane Karney – Creston, Calif.
JoJo LeMond – Andrews, Texas Kyle Lockett – Visalia, Calif.
Daniel Green – Oakdale, Calif. Erich Rogers – Round Rock, Ariz.
Rylen Sutherland – Benton, Ky. Trevor Meier – Garden City, Kan.
Dillon Jones – Weir, Miss. Hiyo Yazzi – Brimhall, N.M.
Allen Morse – Dawson Springs, Ky. Cole Walker – Sparta, Tenn.